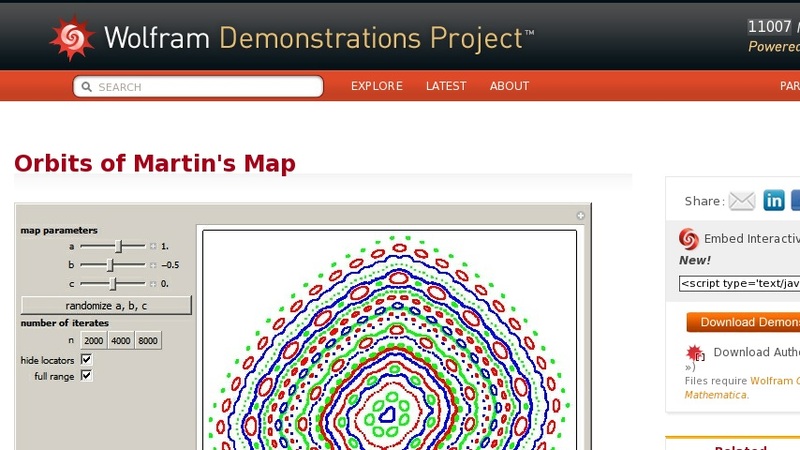 This is the two-dimensional map known as Martin's map: ... , ... . Orbits are generated by iterating the map ... times using different initial points. The map parameters ... , ... , and ... can be varied manually or a random set can be launched. Three orbits are plotted initially, starting from three different initial points marked by locator objects " ... ". You can drag these initial points or add and/or delete new ones (Alt+Click on Windows) inside the plot. Three orbit colors are used cyclically.